Our well experienced supply chain team manages every shipment in highly efficient way so that the goods made in our North and South Indian units reach Indian ports at the same time, on time for shipment. SEVEN SEAS< works with nominated shipping and forwarding agents to make shipping and custom clearance easier and faster. We offer our precious clients the premium quality Automobile Logistic Service. Offered service is widely demanded by our precious clients owing to its cost-effectiveness and high reliability. Capacity: Daily 100 CBM Cargo Capacity. Service Area: Worldwide Area Country. 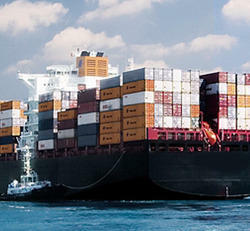 S.R.Logistic provide door-to-door delivery services for sending parcels and large consignment, across the world. Our well trained professionals efficiently handle PCs, computers, printed materials, peripherals, product samples, spare parts etc. We believe in carrying with take care and handle every consignment in a personalized manner. We offer our precious clients the premium quality Automotive Logistics Service. Offered service is widely demanded by our precious clients owing to its cost-effectiveness and high reliability. Operations Chennai A.S.Shipping Agencies Pvt Ltd, has always strived hard to ensure the safety our clients’ cargo and have taken essential measures in moving sensitive cargoes, that need special care, to a Custom notified “Storage Hub indigenously developed by Greenways Group, for safe, secured and economical storage.